This is a trip to Greenland where Greenland's nature is seen from the sea. On this trip several sailing on Disko Bay are included, giving you plenty of time to see the many huge icebergs floating past. There is no guarantee of spotting whales, but we are as close as you can get. The chance of encountering the giants of the sea is great. 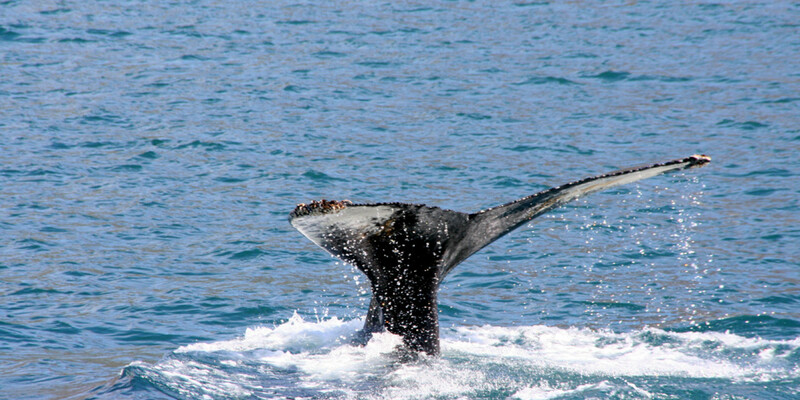 Humpback, Fin and Greenland whales are all types of whales we frequently encounter. In the country side there is plenty of natural beauty and a fine, genuine Greenlandic atmosphere in the towns and villages, we visit along the way. Arrival to Ilulissat - transfer from the airport to the hotel, incl. Depending on your arrival time, there are plenty of impressions to get in Ilulissat. Take a walk around town and inhale the atmosphere. The colorful houses are painted in a rainbow of shades, and give a good contrast to the bay deep blue sea in which the giant icebergs float by. In the Disko Bay, Qasigiannguit is known as the capital of Whales. It is exactly here the many humpback whales gather together in the summer. To get to Qasigiannguit, we must cross Kangia fjord, where icebergs float out into the Atlantic Sea from the ice cap. The submarine moraine ensures that the big icebergs run aground, and for that reason they are visible to us when we sail down to Qasigiannguit. After arrival at Qasigiannguit we will be picked up by the hotel which takes us a few hundred meters from the harbor to the hotel. Hotel Diskobay is superbly located overlooking the bay. The rest of the day can be enjoyed in the town, which mainly lives by fishing. Enjoy Qasigiannguit, one of the larger towns, where you can experience a good part of today's Greenland. Nature is just outside the door and the area around Qasigiannguit offers some of the most passable hiking terrain. We depart from Qasigiannguit to Qeqertarsuaq via Aasiat. The trip provides a unique opportunity to experience one of the less visited towns in Disko Bay. 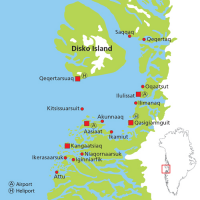 In Aasiat we change boat and sail to Disko Island and Qeqertarsuaq. DiskoIslandis somewhat different from the rest of Greenlandwith mighty basalt mountains rising behind the town. One of the tours, you just have to do, is the trip out to Kuannit. 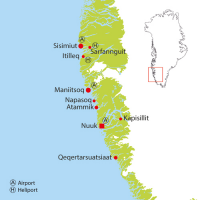 Kuannit area is known for the distinctive basalt columns, and the many hot springs. A short trip you can always fit into your program is the trip out to "Udkiggen". "The Lookout" is a point south of the city from the coast. From here there is a magnificent view over the southern part of Disko Bay, and from here the whalers in both historical times, like in the present, scouted for whales. In Qeqertarsuaq area the opportunities for diverse activities are plenty. In the summer time dog sledding is possible on top of Lyngmarksbræen - one of the only places in Greenland where dog sledding is possible in summer. You can hike up to the top and return the same day, or you can choose an overnight stay in a charming cottage on the glacier. From the top of the glacier in approx. 1200 m altitude, there is a spectacular view of Disko Bay, and you get a fine view of the sea we sailed on the trip. If you are up to more maritime experiences, different boat tours, whale watching and fishing are offered locally. After some eventful days, it is now time to say goodbye to Disko Island. We leave in the late afternoon, which leaves you time enough for the last experiences, and maybe buy some unique souvenirs. The hotel will take us down to the cosy natural harbour where the ferry waits. Day 7: Departure from Ilulissat. Depending on your onward travel plans, you have the opportunity for more adventures in Ilulissat. The town buzzes with life in the summer months, when the sun is high in the sky. Below you will find more general information about the destinations we visit on this trip. You can combine your travel to Greenland with just the elements you wish. Humpback-, minke-, and fin whales can be seen. Sleddogs will be seen in every City/Villages. But dogsledding is only possible at the top of the Lyngmarks Glacier (limited periode). Dogsledding not included. Welcome to Ilulissat. Ilulissat is the third largest town in Greenland, also called Jakobshavn, and rewards you with one of the greatest natural wonders of the world: Ilulissat Icefiord/Kangia. The Icefiord became one of the UNESCO World Heritage Sites in 2004 and is the birthplace of the massive collection of icebergs that have calved from the Sermeq Kujalleq glacier, one of the most productive glaciers in the world. Ilulissat is the perfect iceberg paradise in Greenland. Ilulissat is a charming town, and the colourful houses on the hill are a beautiful mix with modern buildings in correlation between man and nature. A walk around town on your own or with a guide is a must do. Ilulissat is, no doubt, a unique place and the view to the impressive icebergs floating in the Disko Bay is a spectacular sight. Around the town you will see sled dogs waiting for the winter to come. Centrally placed in the town we find “brættet”, where fishermen and local hunters sell their fresh catch to citizens and tourists. The supply is varied, and you will often find halibut, cod, seal and occasionally reindeer -, musk -, and whale meat. The town also houses 2 interesting museums: Ilulissat Museum, the birthplace of famous arctic explorer Knud Rasmussen, and the art museum, which displays some beautiful watercolour paintings of the local painter Emmanuel A. Pedersen. The harbour is centrally placed in the old part of town next to the hospital. Here you might be lucky to see the locals kayaking and practising the Eskimo roll. The town provides a well-stocked supply of shops selling beautiful handicraft etc. and you will easily find great and unique souvenirs. Some of the local artists have a workshop near by the harbour, and people are welcome to pop in to see them processing bone and tooth into beautiful jewellery. The dog sledding season begins in September and normally ends in May. During the 4 months in between, the dogs usually are inactive. New litters are raised and the puppies ravage and bite in everything within their reach. The fresh air stimulates your appetite and fortunately you will find several good restaurants in Ilulissat. They naturally use fresh Greenlandic commodities in their cooking. You might as well start looking forward to delicious lamb, reindeer, musk, shrimps and halibut - Takana! When hiking to the old settlement of Sermermiut, you are walking along Ilulissat Ice Fiord. from here the view of the stranded icebergs is absolutely perfect. Go on a boat trip among the icebergs, under the midnight sun - it is an experience for life! If you want to experience the Kangia glacier and the enormous icebergs in Disko Bay from a different perspective, you can do so by helicopter from Ilulissat. It is possible to go on a whale safari surrounded by icebergs in the Disko Bay. The boat trip gives you plenty of time to observe the giants of the sea at close range. Qasigiannguit is beautifully situated in the Disko Bay and surrounded by high and steep mountains rising approx. 450 meters. It is a modern town with everything you need, yet still an original settlement full of atmosphere with everything to be found at a walking distance. Take a walk a see the many colored houses and feel the atmosphere. The number of cars is limited and you will often bump into “Mr. and Mrs. Greenland” strolling around town. This is the local fish market, where local hunters sell today’s catch. Have a look and see the varied supply of halibut, cod, seal and occasionally reindeer -, musk -, and whale meat. On selected Sundays the city museum in Qasigiannguit illustrates life in Greenland around 18th century. It is possible to gain a unique insight into the old way of living. On Sundays we recommend that you attend the service in this beautiful church. From the hotel terrace there is a fabulous view of the Disko Bay. Humpback whales often swim in the waters just outside the hotel's restaurant and terrace. Go on a trek to Kangerluluk, with the magnificent view over the Paradise Bay and the fascinating geological phenomena; a beautiful grain with Rosen quartz and sparkles in the hill. On this trek you may be lucky to see musk ox in the area. Climb the city's most prominent peak, the 450-meter tall Mount Qaqqarsuaq. The view from the peak is impressive, overlooking Disko Bay and the ice fiord. Great fishing at the mouth of "Laksebugten". 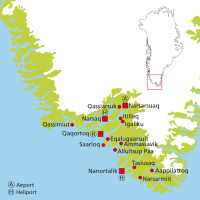 Geologically the Disko Island is far younger than the mainland and seems very different. The Island mostly consists of high and steep basalt mountains that were created by volcanic activity 25-65 million years ago. Qeqertarsuaq town is beautifully situated in the Disko Bay and is set against a backdrop of magnificent basalt mountains and waterfalls splashing down the mountains. The sea, just in front of Qeqertarsuaq, is a favourite foraging spot for the humpback whales in the summer and we may spot the whales, from the boat as well as from the land during our stay on the island. We recommend a stroll around town. The colourful Greenlandic houses contrast the huge basalt mountains outside town perfectly. A short hike leads you to the coast, and here you will see the huge icebergs grounded at the Disko Bay or slowly drifting by in the Bay. See today’s catch on the local fish market “Brættet”. On the Disko Island you will find many fine trout rivers and the island has proud traditions of heather-smoked trout in summer. Buy one if given the opportunity – you won’t regret it! At the museum you will learn about the area and its fascinating story during the colonial period, when the colony ‘Godhavn’ held a powerful position. And was a key location for whaling and trade. The museum also displays a magnificent collection of paintings by the artist Jakob Danielsen as well as portraying the interesting history of the town. Disko Island and the area close to Qeqertarsuaq is ideal for hikers and you will find many hiking trails on the island. is the Greenlandic word for quantum “kuanneq”. Besides being known for its lush and green nature, Kuannit is also known for its characteristic basal mountains and “hot” springs. is a spot south of town out by the coast. From here you have an incredible view of the Disko Bay and the spot has been a lookout for whales and seals since time immemorial. Arctic conditions considered, the valley shows a lush and varied species of flora. Thanks to the Lyngmark Glacier that rises many hundreds of meters above the coast, dog sledding is possible in summer - – one of the only places in Greenland that offers dog sledding in the summer. Either you trek to the top and back on the same day or choose an overnight stay in a charming hut on “Lyngmarksbræen”. From the top of the glacier at 1200 m. we will have an outstanding view over Disko Bay and a fine view of the water we have sailed. If you are tempted by further maritime adventures, it is possible to buy different boat trips, whale safaris and fishing trips locally. Disko Line is accredited the best credit rating by the analytic company, Bisnode.